This 1976 Autobianchi A112 Abarth is a third generation 70HP 1050cc example that was campaigned as a rally car in Tuscany for many years in the 1980s and 1990s. In 2010 the car was returned back to road specification, with a few racing modifications retained. The A112 is a front wheel drive supermini that was a precursor to the Fiat 127, and the Abarth version remains sought after as a dual purpose road and track car. This car has ASI certification and was recently imported into the US. It is sold with a clear Louisiana title. After the car was retired from racing in 2010 it was repainted in the original Italian Flag green with contrasting satin black hood. The original 13 Cromodora wheels with Abarth scorpion center caps have been restored and look great. The interior was restored to largely original condition, though an OMP racing kill switch is still installed on the dashboard. The roll cage has been removed but the mounting platforms for the cage are still in place. Original style seats and a two spoke Abarth steering wheel are now fitted. The windshield has numerous chips and scratches but is still functional, and the fuel gauge is not currently working as the car still has a racing fuel cell installed. The fire extinguisher visible in several interior photos was removed prior to shipping and is not included with the car. During the 2010 work to return the car to street specification the 70HP 1050cc engine was removed and serviced as needed. It retains a racing hill climb close ratio gearset and Magneti Marelli front strut tower bar. The car runs and drives well, with the seller having completed a 1000km drive from Italy to Stuttgart, Germany with no issues prior to importing the car into the US. The undercarriage is solid with no major corrosion in the floors or other notable damage. The sale includes a certificate from the Italian classic car registry A.S.I. that was issued in 2002. The original Italian title documents are also included in addition to the current Louisiana title in the sellers name. A number of period racing photos of the car can be viewed in the gallery below. The A112 Abarth is a rare site in the US and this looks like a good one. Visit Our Website at WWW.ADCOXIMPORTS.COM for More Pictures!! 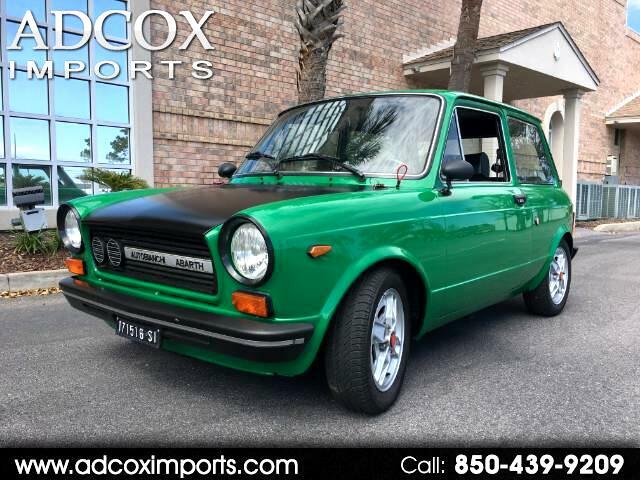 Message: Thought you might be interested in this 1976 Fiat Custom.